Tiger kingdom: drugged or not drugged? As the tiger lowered his neck, his eyes stalked our kids running back and forth outside the cage. I'm sure, given the chance, the tiger would follow it's natural instincts and eat our kids. Of course, this was happening while my husband was petting the back of the tiger. The kids and I were lucky enough to spend time with the baby tigers. Could they possibly be any cuter? We had a great time cuddling and petting the babies. We even got a picture of Cam petting the tigers. Although, him being so small had the handlers a bit worried. Every time the baby tigers made a beeline for Cam they moved the tigers away. I guess he was perfect prey size. Once you are done petting the tigers you are free to walk the grounds and view all the tigers. The tigers we saw were full of life and playful. Some were even aggressively marking their territory on other tigers. We are no experts on tigers (or drugs), but in no way did we think the tigers were drugged. Watching that tiger instinctively watch our kids as they ran outside the cage sent chills down my spine! Cats are cats and they sleep 18 hours a day, just like kitty at home, lazy cat! These tigers seem well feed and well taken care of. There are around 50 tigers at Tiger Kingdom and they are rotated so no tiger gets too many hours with an over abundance of people. 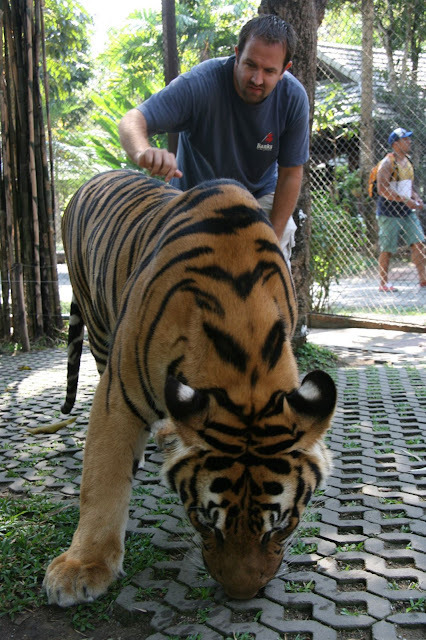 Tiger Kingdom is one of the most popular destinations in Chiang Mai. We rented a songthaew for 200 Baht for the 20 minute drive there, the wait and then bring us back. There is an english speaking host out front that will help you figure out your tiger package. You only get 15 minutes with the tigers so enjoy the moment! All tigers there are under 2, after 2 people cannot be with the tigers and the tigers are sold to zoos. So tiger kingdom is a tiger farm. Tip: Go early to avoid the crazy long lines. Eat elsewhere, food is over priced here! Stop on the way back and get some yummy strawberries but remember to negotiate the price of the strawberries! Have you been to tiger kingdom? What did you think?